Founded in 1995, NetDepot specializes in cloud-based hosting and dedicated servers and caters to a host of clients, from small businesses to large corporations. NetDepot has an expanding network of data centers located throughout the United States. The network infrastructure is built on a public network based on a public network comprised of several redundant providers. 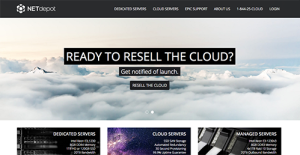 On its cloud servers, NetDepot promises clients a 99.9% uptime or their money back. On its dedicated servers, the company provides a 100% uptime guarantee on its power and network. NetDepot has three data centers located in Atlanta, Dallas, and New York, ensuring clients of reliable and seamless hosting service. How Much Does NetDepot Cost? NetDepot allows the installation of cPanel software licenses for those who want to use cPanel for their account management and administration. That said, NetDepot has its own control panel that includes basic and advanced features like DNS management, Improved Support Channels, Cloud Servers, and VPN Auto Activation Utility to mention some. Every company has its own characteristics, and can call for a particular type of solution that will be adjusted to their business size, type of customers and staff and even specific niche they cater to. It's not wise to count on finding a perfect service that will be suitable for every business no matter what their history is. It may be a good idea to read a few NetDepot reviews first and even then you should remember what the hosting service is intended to do for your business and your employees. Do you need a simple and intuitive hosting with just elementary features? Will you really use the complex functionalities required by experts and big enterprises? Are there any specific features that are especially practical for the industry you work in? If you ask yourself these questions it will be much easier to get a solid service that will fit your budget. We realize that when you make a decision to buy Hosting Services it’s important not only to see how experts evaluate it in their reviews, but also to find out if the real people and companies that buy it are actually satisfied with the product. That’s why we’ve created our behavior-based Customer Satisfaction Algorithm™ that gathers customer reviews, comments and NetDepot reviews across a wide range of social media sites. The data is then presented in an easy to digest form showing how many people had positive and negative experience with NetDepot. With that information at hand you should be equipped to make an informed buying decision that you won’t regret. What are NetDepot pricing details? There is no information on their website stating that they support WordPress. All of NetDepot's facilities are secured with physical force prevention and manned by staff 24/7. Emergency systems for fire and temperature are also installed to ensure that the facilities are safe even during emergencies and extreme weather. NetDepot guarantees a 99.9% uptime or your money back. While there is no information specified on their website, observers stated that NetDepot offers specialized services for eCommerce purposes. NetDepot supports Linux, FreeBSD, or Windows 2008, although a licensing fee must be paid for the Windows platform. No. NetDepot does not provide a free domain with their hosting products. No. NetDepot does not offer unlimited email addresses and bandwidth on their packages. Do they let you effortlessly create a website without any HTML or coding experience? It seems that NetDepot does not offer a site builder with their packages. If you need more information about NetDepot or you simply have a question let us know what you need and we’ll forward your request directly to the vendor.